Home Company Frey in 2018 – summary of the year. The end of the calendar year is approaching fast… and, across Poland, we are experiencing a time before Holiday break, and being a nostalgic time for Polish people, Frey would like to briefly sum up 2018. The year has marked numerous significant milestones for Frey, in particular growing the Frey brand’s global reach and partnering with world class channels partners, winning numerous tenders for Frey AP-300 Perimeter and our TN-100 Non-Contact Tonometer…and manufacturing has been at capacity since July 2018! Wojciech and Jacek Frey proudly launched a new multi-million € state-of-the-art manufacturing plant to manage growth expectations and to enable full production capacity of the new Frey SL-100 LED Slit Lamp and Digital Imaging System (SLI-200), along with planned new product pipeline second half 2019. Frey sincerely thanks all of our partners worldwide in helping the company achieve and exceed the Frey growth expectations throughout 2018! Frey believe the one secret to consistently delivering technology and commercial success is to build strong trust and meaningful brand value with the company’s valued channels partners, and to constantly improve the manner in which the company communicates, effectively and efficiently provide real-time product information and inspire sales excellence. 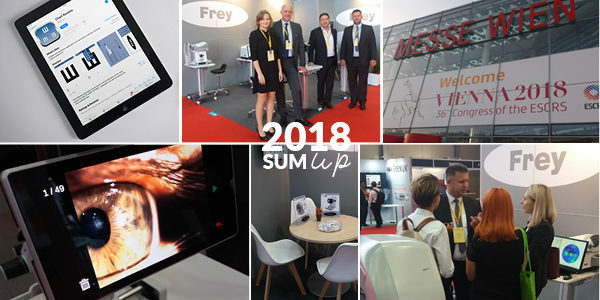 Frey has invested significantly into sales, marketing and technical support this year, and has increased Frey brand investment and visibility across the most important Ophthalmic and Optometric European, APAC and national exhibitions. APAO 2018 Hong Kong and ESCRS 2018 Vienna lifted the Frey brand significantly and 2019 will herald continued investment in APAO 2019 Bangkok and ESCRS 2019 Paris along with selected regional and national exhibitions. More on Frey plans for 2019 very soon! Each quarter Frey will communicate new digital marketing collateral, with focus on highlighting new product information and suggested diagnostic tips along with new functionality. Frey encourage your engagement and feedback as to how the company can provide optimal materials to better support your sales and marketing efforts. Frey plan to commence a regular series of product and technical training for the company’s channel partners. This strategic imperative will focus Frey actively seeking our channel partners feedback on how best to provide optimized support to meet your exceptions, along with end user product feedback. Frey will actively participate in Local Ophthalmic and Optometric Exhibitions during 2019. Frey respectfully request our valued channel partners communicate your business and exhibition plans as early as possible in 2019, so that Frey can make a meaningful contribution, whether DEMO devices, providing up-to-date digital collateral and product imagery, along with Frey direct sales support by joining your exhibition. Frey website has recently been updated. Landing page has been refreshed with new digital content. Frey encourages your feedback and thoughts how best to continually improved Frey website offering! Frey will exhibit during APAO 2019 Bangkok and have planned an excellent booth position. As more information becomes available, Frey marketing team will update you, and look forward to seeing you in Bangkok, March 2019!